Cruise Confidential… | Help! I live with my Italian mother in law! ← For the love of…routine? As most of my readers already know, I ended up in Italy after falling in love with an Italian Navigational Officer onboard a cruise ship. For six years I sailed around the Caribbean in various jobs on various cruise lines. For those who always wanted to know what goes on behind the scenes on cruise ships, read this interview then buy the book. Hi Brian, thanks for taking the time to do this interview with me. First let me congratulate you on the success of your book Cruise Confidential. I honestly couldn’t put it down and I loved your rich humour and ability to describe life onboard in such detail. I felt like I was right there with you hanging out on B deck with a full bottle of wine at 3 a.m.
For years I struggled with trying to describe ship life to my family and friends but your book has really nailed it for me. But then again, I am a former crew member, and like you, I held different jobs onboard and so had some diverse experiences. My only concern about telling my dad to read it is that he may disapprove of the “hedonistic environment” that his daughter was living even though I was already well into my 30’s! I have read a few of your Amazon comments but I want you to put into your own words this: How would you say your book has been received by the general public? Do you think they “get it”? Unfortunately no, I don’t think the general public gets it. Putting yourself into shoes so radically different is hard. I tried my best to convey the realities of being crew beyond tangibles such as long hours, focusing on attitudes and how they change. Most of the general public simply thinks I’m a liar. That’s especially true when it comes to the partying. My sense is people forget just how much energy they have when they’re young and unburdened, such as at college. On the flipside, how have your colleagues and the corporate cruise lines (in particular, Carnival) reacted to your book? My greatest happiness comes from colleagues around the world who use my book to share with their family what ship life is really like. You simply cannot explain ship life, you have to live it. The closest you’ll get otherwise is, perhaps, a book. It has been overwhelmingly well received among crew members. This is why I don’t sweat it when landlubbers call me a liar. Those who know, know. 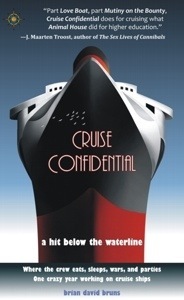 And as for the cruise lines themselves, when Cruise Confidential was released they distinctly ignored it. That was the smartest move they could make. When word of mouth spread and Carnival’s spokesman and star blogger, John Heald, had to say something, he lied through his teeth. Mr. Heald boldly claimed that he ‘met me many times and knew me well,’ (we’ve never even met), ‘worked on the same ships as me at the same time,’ (patently false and easily proved in the public record) and that everything I wrote was pure fiction. Of course, he had to say that. At least he agreed the book was funny! What advice would you give to someone who wanted to become a crew member on a ship? Be ready for everything you’ve ever known to change. Be ready to give up comfort on every level, as well as all control of your life down to the tiniest decisions. Most importantly, take advantage of all the amazing colleagues you’ll be thrown in with. Expand your world view and get to know people from all over the earth. It’s far, far more rewarding than you can imagine. I have worked on several cruise lines myself and as a crew member I preferred Carnival but if I was a passenger I would have preferred Princess. I could also tell you who is on my worst list but lets get back to you…Now that you have sailed on a few different vessels, do you have a preference as a crew member? Carnival is awesome and probably my favorite cruise line. Despite getting completely hosed by their corporation machine, I don’t hold an enmity for them. Barring perhaps Princess, one of the few lines I never worked on, Carnival is definitely the most generous to crew, providing great opportunities and quality of life. As a guest, well, I can’t really say which is my preference. I guess it depends on what I’m looking for. Carnival always has the party, that’s for sure, but for quiet you can’t beat Holland America. Without ruining the ending for those who want to read the book, would you do it all over again for the woman you love? Hell yes. Love is the most important thing there is, for another and for yourself. What would you change, if anything, if you had to do it all over again? While I don’t regret being faithful throughout my ship life, I cannot deny it was tough watching a zillion amazing, exotic, and rare opportunities for romance slip by. It’s interesting to contemplate how different my life would have become should I have hooked up with one of my South African friends, or this one Lithuanian I’m still smitten with. Had I been single, my whole life would have no doubt changed. Your experiences started in 2001, would you say that ship life has changed much in the past 10 years? The wild side of ship life has toned down significantly. The biggest impact on the crew was surely making the crew bar nonsmoking. This coincided with a crackdown on the obsessive drinking. In my time Carnival gave free hard liquor at their crew parties, but now it’s generally only beer and wine. But crew still have access to duty free liquor, and I’ll wager rare is the cabin that doesn’t have a bottle or two of something around. The industry still works their crew day and night, but have found better ways of hiding it. As an educated man, how did your family and friends react to your decision to leave the U.S. and go serve food on a cruise ship? I was probably already considered a black sheep in the family, so I don’t think they were particularly surprised. My mother’s only concern was that I’d move permanently to some far off land and make babies that she’d never get to see. This entry was posted in Tourists, travel and tagged crew, cruise ship, cruising. Bookmark the permalink. This looks a really interesting book,and a realistic one too. I’ve certainly heard from others about the long hours and rare days off working on cruise ships. Glamorous on the outside, but really hard work. I worked on ships and although I don’t know the author personally we both worked during the same time period for the same cruise lines. His stories echoed many of my own so therefore I have no doubts about his credibility. It’s a shame some people don’t believe him.